I’ve had some version of this complaint since at least 2005 (click the category links at the bottom to see past posts). Even though the playoff format has changed in a big way in the interim, I still don’t like it, and 2018 American League again shows why. First, however, the National League of 2018 shows some clear advantages of the current format. The Cubs and Brewers have a weekend showdown (albeit not playing each other) over which one will win the Central. Whichever one does will also have the league’s best record. The other will be the first wild card. The stakes are high! The Dodgers and Rockies also have a showdown (again, not playing each other directly) over which one will win the West. The loser of that contest might be the second wild card, but the Cardinals are still alive, and so the loser of the West race could get left out entirely while the Cards get the (second wild) card. And to add spice to it, the Cards and Cubs (long time rivals!) play each other over the final weekend with both teams having playoff berths (or at least seeding) on the line. Meanwhile, in the American League, we see the fundamental problem with the current format on full display. The Indians clinched their division a full week ago. At the time, their record was 86-68. The Tampa Bay Rays had the exact same record on that date, yet were on the brink of elimination. The Seattle Mariners were, on the same date, 85-69. Three teams within a game of one another in the standings. Yet one of them got a week to get rested and set up its rotation, while the other two will sit out the postseason. The AL situation this season reminds us of the arbitrariness of the divisional alignments. While they are geographically accurate (unlike the NL before 1998), they can reward a mediocre “division winner” while shutting out teams with approximately identical records who just happen to be in tougher divisions. A related effect is that the AL Wild Card one-game playoff is going to pit the third and fourth (possibly second and fourth) best teams in the league (by W-L) against each other, while the fifth (or possibly sixth) best team gets to go straight to a Division Series as the League’s No. 3 seed. While I was praising the NL situation earlier, I would be remiss if I did not note that, despite the good races to the finish in that league, there actually will be a similar unfairness in the outcome. The NL West winner is likely to finish with a worse record than the first wild card, and possibly in a tie with the second wild card. It just won’t be as stark a difference as the one in the AL. Could this be remedied with better institutional design? Of course! I still prefer my Two Divisions, Two Wild Cards idea, first proposed in 2010, years before the current format (which is three divisors and two wild cards) was adopted. Of course, it is very unlikely that MLB will reduce the postseason back to four teams from the current five. As much as I do not like the one-game postseason “series” of the current wild card playoff, I could live with it–in modified form. How about Two Divisions, Three Wild Cards? Bear with me a moment. I want a system that maximizes the chances that the best teams face off in the LCS and one of the very best makes it to the World Series. I don’t want to spot a mediocre team a top playoff seed just because it happened to win a weak division (i.e., this year’s Indians, but also several recent division winners). And I don’t want a first wild card that is well ahead of the second to have just one chance to get beat by an inferior opponent. The basic problem is small divisions magnify the odds that a weak team gets a division title. So two divisions are better than three! It is not ideal to have divisions of different size in a league. With 15 teams per league, this proposal would require it (unless some more cross-league shifts were made, making the leagues different sizes instead of the divisions within each league). If this were in place now (and we’ll assume the records would be the same as they actually are), the AL teams would be: Red Sox (AL East, as actually), Houston (AL West, as actually), Yankees and A’s (first two Wild Cards, as actually), and a still live race between the Indians and Rays and, more marginally, the Mariners for the third Wild Card. One could still introduce a first-round playoff structure that rewards division winners over wild card winners, if one wanted to do so. For instance, the first round could be a best of seven with the division winner having the first three games at home, instead of only the first two–while still having the last two if it went that far. Or under a best of five, one could similarly ensure the division winner four home games if the series went the distance. Another thought is an asymmetric series: the division winner advances after winning two games, but the wild card has to win three. I will not consider any of these integral to 2D2W [or the new proposal]; they are additional considerations. Every institutional structure one can devise has problems as well as advantages. That is true of baseball championships as much as of electoral systems. And it is certainly true of this one. But I believe it would be an improvement on the current format. In any case, enjoy the last weekend of the regular season, and the playoffs that follow! The 2017 Major League Baseball season offers a strong indictment of the current format of two wild card teams. I rarely see or hear criticism of the new format; the consensus of the writers and talking heads seems to be that adding the second wild card has been a masterstroke, simultaneously making division races more meaningful and creating exciting races for each league’s last slot. This year’s final standings come up short on those aspects, and more importantly, on another that has concerned me ever since the format was adopted. This season, we do have some very deserving division winners. Two AL teams (Astros and Indians) have over 100 wins, as does one NL team (Dodgers). Another NL team has 97. However, if the selling point of the format is that it makes races exciting, this season did not deliver so much. Most of the second half of the season, it was fairly clear who was going to get nine of the ten postseason slots. In the AL, the second wild card was more up for grabs, as a bunch of mediocre teams (including my favorite team) vied for the slot. In the NL, most of the season, the two eventual wild card winners were close to one another, but far ahead of the pack. Only a late winning streak by the Diamondbacks and a slide by the Rockies let the Brewers back in and made the race for the second wild card somewhat interesting at the end. Now look at the wild cards. The gap between the two winners in the AL (Yankees over Twins) is six games. In the NL it is also six (Diamondbacks ahead of Rockies). In both leagues, then, we will have single-elimination games pitting teams whose regular-season finishes were not even close. It is fundamentally unfair in baseball to give a team so decisively surpassed during the regular season one shot at dethroning the team that bested it during the 162-game schedule. If it happens in a best-of-5, or preferably a best-of-7, well, that’s the way it goes sometimes; a series is a fundamentally fairer way of giving a lesser team a shot and is what has made the postseason compelling ever since divisional play was introduced in 1969. The wild card is also a splendid idea. It prevents one of the league’s top teams from missing the postseason entirely despite having a better record than one or more division winners. But as soon as that postseason starts, one unlucky game can end the superior team’s season at the hands of the inferior team. This year, one of the wild card teams has the same record as one of the division winners. Yet the Cubs would not be eliminated until they lose three games (and it would be to a team with a better regular season record), while the Diamondbacks would be eliminated if they lose only one (to an inferior team). This is fundamentally bad institutional design. The design of institutions is something we care a lot about here. There must be a solution to the problems I have identified in the current MLB playoff structure. I still prefer my previous proposal of “two divisions, two wild cards” (2D2W) wth or without the “asymmetric series” that I also proposed. However, when I made the 2D2W proposal, I was arguing for keeping the number of teams advancing to the postseason at four rather than the new format’s five. Even if MLB recognized the improvement my plan offers over the status quo, it is highly unlikely the number of teams making the postseason would ever be decreased. So, we need to work with five teams advancing, while satisfying my criteria of not having a single-elimination game that might pit teams with substantially different records against one another, and also preserving the current principle of some reward for winning a division rather than a wild card. (Ideally, also enhancing the odds of the team with the best record getting to at least the LCS, or at least not reducing those odds.) I have tried to game out (so to speak) postseason formats that would balance these goals. I have failed. Maybe someone can come up with a plan. As I said in my 2015 version of this complaint, whatever the outcome, October ball is almost here, and even dumb institutional design can’t ruin that! It is the last day of baseball season, and also the last day of the Jewish year, 5776. Actually, it might not be the last day of baseball season–depending on what happens today. I am writing this just before all the “final” day’s games are about to begin. We could still have a tiebreaker game tomorrow in either league, and those count as regular season games. We could even have a game from the original 162-game regular season tomorrow–the Indians and Tigers will make up a rainout if either the Tigers remain in contention for a Wild Card slot or the Indians need the game to decide seeding in the Division Series. And, while the Mariners’ loss yesterday ended the dream of a four-way tie for the AL’s two Wild Card berths, a three-way tie is still possible. That scenario would mean the regular season make-up game tomorrow, followed by tiebreaker games Tuesday and Wednesday to eliminate one of the three. We’ve never had a three-way tie for a postseason berth. The Tigers (and their rivals) have to cooperate both today and tomorrow to get us there. Why not cling to the 2016 regular season just a little longer? As for 5776, there is no question it is the last day, ready or not. We will get to mark the new year, Rosh HaShannah 5777, with first fruits from our land. The bowl shown here contains the first two pomegranates and jujubes of the season, picked today. The ‘Bartlett’ pear is also the first, though these need to ripen of the tree; I picked it several days ago, and it is just now about ready to enjoy. 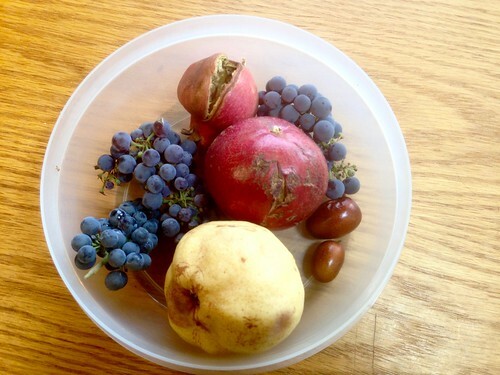 The bowl also contains small bunches of each of the red grapes of our property. I believe they are, from left to right, Syrah, Barbera, and Zinfandel. They were planted by the previous owner, so I am going by the map of the vineyard, which is not the easiest to read. The grapes are not “first” fruits, as we have been harvesting them for several weeks and are near the end now. 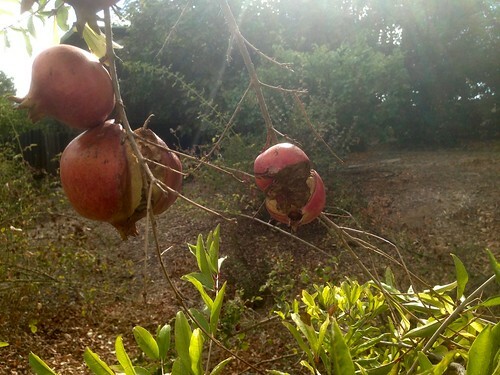 The pomegranates are, at top, an Ambrosia. 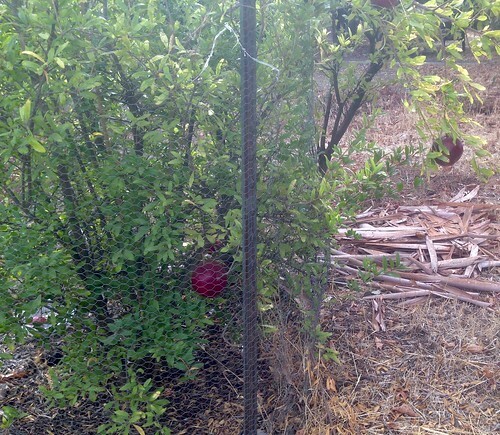 It has split, as pomegranates often do, and may not actually be ripe yet. The other is an unknown variety–we have three, planted by the previous owner, and for only Ambrosia did a tag survive–and should be ripe. Here are some more Ambrosia on the tree, which set heavily this year, while the second photo below shows the other one, with a few of its lighter set. 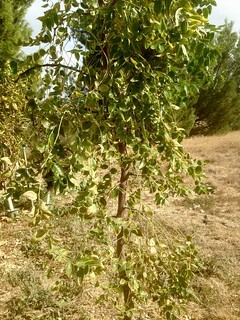 The jujubes (‘Jew Jew Be’) are the first ever to ripen here, on a tree planted two years ago. They are of the ‘GA866’ variety. Not the snappiest name, but a great-tasting variety that I also grew when we lived in the San Diego area. The tree has grown well; look closely at this photo and you might see the one remaining fruit. Yes, its first crop was just three fruits. One must start somewhere. Shanah Tovah. May we have a sweet and fruitful 5777! And an exciting end of the (extended) regular season and postseason! Regular readers will know how much I dislike the current major-league baseball format of three divisions (which we have had for a while now) and (more recently) two wild card teams who face each other in a single game to decide which one goes on to the Division Series. Just last night I again heard an announcer praise how wonderful this format is; I think they must be under some sort of directive from on high to repeat that mantra. The NL is, however, a very different story. And not for the first time. The two wild card teams (Pirates, then Cubs) are currently separated by 5.5 games. Mets fans have to really love the current alignment of the divisions. Their team gets to be the first to clinch a division title… despite having the FIFTH best record in their league. (When the Dodgers lost a little later on Saturday, the Mets backed into fourth place by half a game.) It makes no sense that a team that–barring a significant closing of the gap in the final week–has finished so far behind the other wild card gets a single shot to knock out a superior team. On the plus side, however, the second wild card may prevent the “injustice” of the league’s third place team (Cubs) having no playoff games while the fourth and fifth likely get crowned as division titlists. Even so, the way it is set up, one of the (current) top three teams would be eliminated in a single game, and either the fourth or fifth best (Dodgers, Mets) is guaranteed to be in the NLCS. I call this an institutional design fail!! Although I still prefer my old two-divisions, two wild cards proposed format, with (or without) asymmetric series to privilege the division winners, I recognize that two wild cards are here to stay. ** One small tweak I would like to see, however, is having the team with best record play in the first round the team among those still standing that had the worst record. Instead, it automatically plays the wild card, regardless of regular-season record. The principle ought to be to maximize the chance that the LCS pits the league’s two best, and in this year’s NL that is evidently going to be two teams from the Central, while one of the inferior teams is guaranteed to advance to the Division Series simply because it beat out weaker competition in its own division. Whatever the outcome, October ball is almost here, and even dumb institutional design can’t ruin that! *The Angels, for those who are not regular readers. Regulars, of course, know this well. The Kansas City Royals have completed a sweep of the Baltimore Orioles in the American League Championship Series. This follows the sweep of the Los Angeles Angels in the Division Series and the sensational one-game Wild Card playoff against the Oakland Athletics. Both the Angels and the Orioles had far superior regular-season records and significantly better run differentials during the season. The A’s had the league’s best run differential, despite their late collapse from a runaway division title to a ten-game deficit at the hands of division winner LAA. It really is hard to fathom how they are doing it. Royal blue smoke and mirrors? Best explanation I can offer. In the just-concluded ALCS, the Royals continue to maximize wins out of few runs. In fact, their run differential is the smallest ever in a LCS sweep, by a good margin. In the series, they scored 18 runs, and the Orioles scored 12. They +6 differential beats the previous LCS record by three runs (1988 A’s over Red Sox, +9). The +6 differential is reminiscent of the White Sox sweep of the 2005 World Series; as I noted at the time, only one prior World Series sweep had ever featured such a low differential (1950, Yankees over Phillies, also +6). Since 2005, there have been two more sweeps, but with typically large differentials (+19 in 2007 and +10 in 2012). Obviously, the minimum possible differential in a four-game sweep is +4. So if you win with a +6, like the Royals just did, you are being exceptionally efficient in your run distribution. Across all sweeps of best-of-seven World Series (19 of them), the average differential is +12.5. In the two leagues’ Championship Series, which have had this format since 1985 (when, incidentally, the Royals overcame a 3-1 deficit to win in seven), there have been six sweeps before this one. The average differential in those six was also +12.5. The Royals sweep was thus historic, setting a record for LCS and tying a record for all best-of-seven series. Too bad they scored that superfluous run in the top of the ninth in Game 2. They could have beaten the all-time best-of-seven sweep “efficiency” record. And crank up the Fight Song!!! 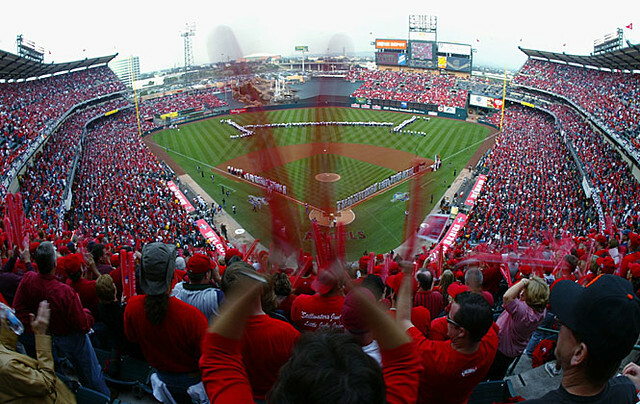 From my seat at Game 1 of the 2002 World Series. Let’s get back there. Because, well, why not? Discuss at will.